CHICO, Calif. - April 2, 2016 - DJ Netto led the Mini Gold Cup at Silver Dollar Speedway on Saturday night with five laps left when he ran out of fuel and allowed Donny Schatz, who started 14th, to capitalize on his misfortune and score his fifth World of Outlaws Craftsman® Sprint Car Series win of the season. "The guys have given me a great car every time we unload here at Chico," Netto said. "Tonight, right out of the box we were good...the main event I knew we were going to be good. We got to the top early and were able to make some moves early before anybody else found it. "We got out to the lead and I felt good. Then we had all those yellows, I was running the fuel valve, bleeding it down, but I guess it just wasn't enough. I felt it stumbling coming down the back stretch and it's a tough way to lose one, but we win as a team and lose as a team and we will come back and try again next week." Schatz, in the Bad Boy/Chevrolet Performance No. 15, captured his series leading fifth victory of the season, four of which have come within the last month. "On the restart, I'm assuming [DJ Netto] ran out of fuel and was right in the middle of the track, and Daryn [Pittman] didn't get a very good start and I was able to capitalize on that" Schatz said. "Passing is such a premium, everybody's got good cars. If there's an opportunity you have to take it - make it or break it." The Fargo, N.D -native struggled with his car early in the night, as he posted one of the slowest times in qualifying. The California drivers appeared to be the ones to beat early on, as both Netto and Tyler Walker passed quick-time recipient, and Friday night's winner, Brad Sweet in their heat race to qualify for the 6-lap Dash. Walker started on the pole-position of the Dash and dominated as he held off Daryn Pittman, who finished second and accompanied him on the front row for the 40-lap feature event. When the green flag dropped on the 40 lap feature, Walker rocketed away from Pittman and Netto, who started the feature in fourth place in the Netto Agricultural/Penny-Newman Grain No. 88N. Walker's lead proved to be short lived, as a hard charging Netto powered by both the leader and Pittman on the outside following an early race caution on lap three. The feature was slowed by a flurry of cautions early, allowing many drivers such as Kerry Madsen, who started 11th, and Schatz to climb their way to the front of the field. One of the cautions that slowed the field early was for Jason Johnson as he hit the cushion and flipped multiple times. Johnson was OK, but his car had to be pushed to the work area, where his crew hastily changed a front axle and got him back into the race. Their quick work allowed Johnson to rebound for a hard fought seventh place finish at the end of the night. With less than 10 laps remaining, Netto had firm control on the top spot as he led Madsen and Pittman by over two seconds. Lurking just behind the leaders was Schatz, who had quietly marched from his 14th starting position to crack the top five. Nearing the closing laps, another rash of cautions slowed the race. As the field prepared for the final restart, Netto led Pittman and Schatz to the green flag. Shortly after taking the green, Netto's car sputtered on the back stretch, leaving his first World of Outlaws win out of reach. Netto pulled off the track and into the pits, handing the lead to Schatz who made his way around Pittman for second just before the leader encountered his issues. Schatz controlled the top spot for the remaining handful of laps, as he defeated Pittman and Shane Stewart for his series-leading fifth victory of the season. 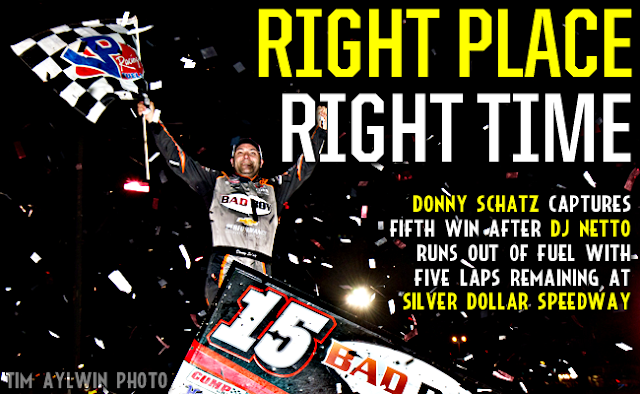 "This race team doesn't give up," Schatz said. "We haven't showed what we are capable of qualifying, but you have to think outside the box a little bit and I think we just eliminated the box. "We had to come a long way to get to that spot. At the end of the race, guys kept doing different things...A lot of scenarios were going on, we had a lot of yellow flags, but that's the way it goes and I am just glad to be here." Pittman had one of the more consistent cars of the night as he qualified third, won his heat, finished second in the dash and ran inside the top three for most of the night, resulting in a second place finish in the feature. "I was just trying to get to the checkered flag," Pittman said. "We got a lot of damage on the front end...I just had to run the bottom because I didn't trust the damage I had. We had nothing for Donny [Schatz] at that point with a wounded car, so I am happy with second. "My biggest mistake was going slow through turns one and two on that restart because I thought the yellow was coming out for [DJ] Netto...but it is what it is, I don't think with a wounded car it would've changed the outcome of the race if we had a yellow and restarted with the lead or not." Stewart, in the American Born Moonshine/Eneos Oil No. 2, quietly came home with another podium finish, his fifth of the season. "It was a solid third place night and I really feel bad for DJ [Netto], it really stinks to lead a race like that and run out of gas," Stewart said. "It was a wild race, it typically is here at Chico. That's the crazy thing about this racetrack is you never know what you're going to get here." The World of Outlaws Craftsman® Sprint Car Series resumes the California swing at Calistoga Speedway for the Wine Country Outlaw Showdown double-header next Saturday April 9 and Sunday April 10. Find out more information by visiting WoOSprint.com/Calistoga-Speedway. RACE NOTES: Brad Sweet finished outside of the top five for only the second time this year...Shane Stewart captured his fifth podium finish of the season...Donny Schatz's 14th place starting position is the furthest back any driver has started and won in 2016. CONTINGENCY WINNERS - MSD Ignitions ($25 cash): Jacob Allen; MSD Ignitions ($50 cash): Donny Schatz; Penske Shocks ($50 cash): Logan Schuchart; JE Pistons ($50 cash): Brad Sweet; VP Racing Fuels ($50 cash): Bud Kaeding; Edelbrock ($50 cash): Jason Sides; Comp Cams ($50 cash): Joey Saldana; Morton Buildings ($50 cash): Willie Croft; Cometic Gasket ($50 cash): Joey Saldana; Super Flow ($50 cash): Greg Wilson; Craftsman/Sears ($100 cash): Tyler Walker;KSE Racing Products ($100 product certificate): Donny Schatz; Comp Cams ($50 product certificate): Donny Schatz; JE Pistons (Set of Rings): Kerry Madsen; JE Pistons (Set of Rings): Jacob Allen. SEASON WINNERS: Donny Schatz - 5 (Volusia Speedway Park on Feb. 14, The Dirt Track at Las Vegas on March 4, Stockton Dirt Track on March 18, Stockton Dirt Track on March 19, Silver Dollar Speedway on April 2); Brad Sweet - 4 (Volusia Speedway Park on Feb. 13, Volusia Speedway Park on Feb. 14, Cotton Bowl Speedway on Feb. 26, Ocean Speedway on April 1); David Gravel - 1 (Thunderbowl Raceway on March 12); Jason Johnson - 1 (Placerville Speedway on March 24); Daryn Pittman - 1 (Royal Purple Raceway on Feb. 27); Joey Saldana - 1 (The Dirt Track at Las Vegas on March 3); Shane Stewart - 1 (Arizona Speedway on March 6). World of Outlaws Craftsman® Sprint Car Series Statistical Report; Silver Dollar Speedway; Chico, Calif.; April 2, 2016. Last Chance Showdown - (12 Laps - Top 6 finishers transfer to the A-feature) - 1. 75-Sean Becker [-]; 2. 1A-Jacob Allen [-]; 3. W20-Greg Wilson [-]; 4. 92-Andy Forsberg [-]; 5. 3C-Jonathan Allard [-]; 6. 98-Sean Watts [-]; 7. 99T-Skylar Gee [$200].